Which Part do You Need? A car emergency kit is one of those things you rarely think about until it’s too late. There are just so many things that give us a false sense of security many people don’t even consider an emergency kit. You might think that joining AAA or some other auto club is all you need to deal with emergencies. Many others also feel if they find themselves in a bind while on the road, they will simply pull out their cell phone and give someone a call. That’s fine and dandy, unless there are problems that render your cell phone useless. Any number of things can happen while you are driving. You could hit a deer while driving on a lonely country road only to discover you have no bars and cannot make a call. You could slide off the road and into a ditch. Your phone falls out the window and into the water and is now useless. It’s times like these that will make you wish you had an emergency kit. Look, it’s not like anything bad will happen to you, but it’s best to play it safe. You do the same thing when you discover a chip in your windshield. Most people ignore the problem, but you are proactive and call Suffolk Glass, your auto glass store in Long Island. Be just as smart by packing an emergency kit for your car. Here is what you will need. In addition to a nice assortment of bandages, your first aid kit should contain gauze pads, tape, aspirin and antiseptic wipes. Don’t just pick up the cheapest fire extinguisher you can find, make sure it is rated for fires that involve kerosene, diesel fuel and other combustible liquids. Never assume that everybody else on the road has a set of jumper cables so you don’t need them. This is just not the case. Get a set of jumper cables that are at least 10 feet in length and coated with at least eight-gauge rubber. There are people reading this who think the flashlight app on their iPhone is sufficient. It might be, but then, what will happen when your phone battery dies? If you think you can just plug it in a recharge, consider the number of scenarios in which your car battery dies and that isn’t an option. If you are unaware, almost anything can be repaired with duct tape. Not kidding here, duct tape is the universal fix-it solution and you need at least one roll, if not two, in the car with you at all times. You should have a tow rope or a tow strap in your car emergency kit. Make sure you buy one strong enough to tow your car weight. You should always have some water stored away in your car emergency kit. You should also have a few non-perishable snacks in your car emergency kit. You don’t have to have military-style full meals, but a few protein bars will be nice if you ever find yourself stranded and hungry. A small shovel will come in very handy should you ever find yourself stuck in the snow or mud. Never assume your car will be running and you can just keep the heat on to stay warm in the event of an emergency. If your car won’t start, you won’t have heat and you will wish you packed a blanket. It is also a good idea to have a pair of gloves and a poncho in your car emergency kit. 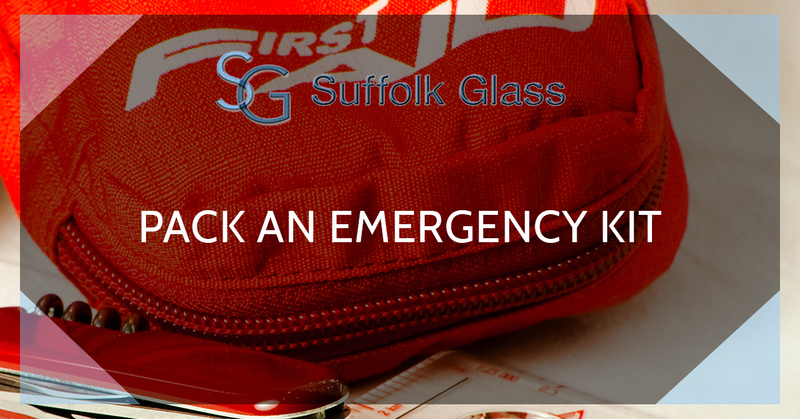 So before you head out on that road trip, pack your emergency kit and contact Suffolk Glass to have your windshield repaired. ©2017 Suffolk Auto Glass. All rights reserved.